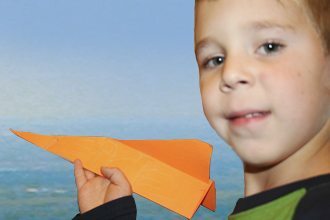 Hayden Morris, 5, was one of several children who recently participated in a paper airplane contest led by Polk State Aerospace Program Director Eric Crump. Polk State Aerospace’s Eric Crump recently led a paper airplane contest for schoolchildren, but the real lesson of the day was much bigger than folding wings or weighing down the nose with a paperclip. As part of a yearlong study on space, 14 students from Winter Haven’s Immanuel Lutheran School toured the Winter Haven Municipal Airport earlier this month. Crump led the paper airplane contest at the end of their field trip. The kids — who ranged from preschoolers to eighth-graders — gathered around a large conference table as Airport Director Debbie Murphy introduced Crump and described how he flew his first plane at just 13 years old. Not surprisingly, this detail of Crump’s start in the cockpit was met with many wide eyes, oohs and ahhs. “There’s no minimum age to get in a plane with an instructor,” Crump explained to the kids, many of whom bounced in their seats with excitement. Crump also briefly described Polk State Aerospace, a new program launching in January to train students to become professional pilots and flight instructors. With that, Crump set about supervising the contest, watching as the students folded and colored their sheets of paper. Then the kids huddled in one corner of the room and launched them in the air, eager to see whose would fly the farthest. The winner of the contest, a boy whose plane easily flew farther than 10 feet, got a 10-minute flying lesson with Crump in the Airport’s flight simulator. 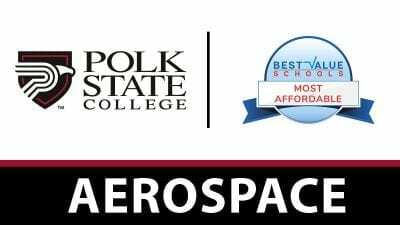 Polk State Aerospace will incorporate cutting-edge flight-simulation technology into its curriculum, providing students with invaluable practice free of the in-air intimidation fledgling pilots often experience in traditional training models. The military and commercial airlines have long used flight-simulation technology, but general aviation has been slower to adapt. 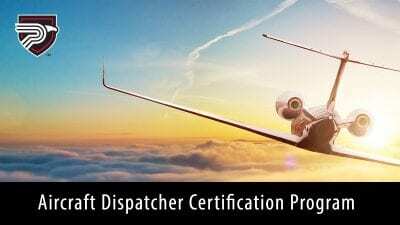 The flight simulator may represent an advanced approach to training new pilots, but for the winner of the paper airplane contest, it was simply cool. “What airport do you want to take off from?” Crump asked the student as they climbed into the simulator. Crump punched buttons on the simulator’s dashboard, and the machine came to life, humming and swaying, its computer monitors displaying the lights of Narita International Airport. The machine angled and Crump and the boy took off — never leaving the Airport but clearly in a world of their own.